Simon’s Career Management Center held another successful “Got Mock?” interview event on February 27, 2015. Students took part in mock interviews, and Rochester-area alums and executives from a variety of industries advised them on best practices for interviews. 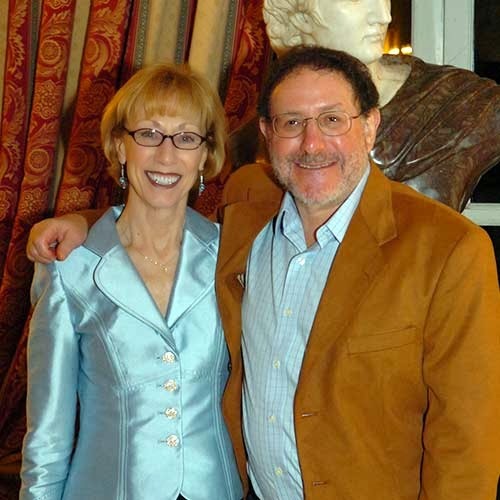 Mark and Carolyn Ain have made a multimillion-dollar commitment in support of entrepreneurship education at the Simon Business School and throughout the University, bringing their total support to The Meliora Challenge: The Campaign for the University of Rochester to $5 million. In recognition of the Ains’ collective philanthropy, the Center for Entrepreneurship is now named the Ain Center for Entrepreneurship. Mark Ain ’67S (MBA) is the former chairman and CEO of Kronos Incorporated, the Chelmsford, Massachusetts-based workforce management company he founded in 1977. He earned his MBA from Simon in 1967. Since 2007, aspiring undergraduate and graduate student entrepreneurs at the University have had the opportunity to present their business models to a panel of judges during the Mark Ain Business Model Competition. and CEO Joel Seligman celebrate the Simon/NYLS partnership. The New York City location of the University of Rochester’s Simon Business School moved from midtown Manhattan to the Tribeca campus of New York Law School (NYLS) in early August through a unique co-location agreement between the professional schools. Joel Seligman, president and CEO of the University of Rochester, and Anthony W. Crowell, president and dean of New York Law School, announced the move in April. The agreement between the professional academic institutions is a creative, multi-year arrangement that aims to form an innovative partnership to optimize resources and capitalize on the different schedules and programs of the two institutions. Simon offers courses in New York City for 13-month part-time graduate programs designed for working professionals, with MS programs in finance, management, and health care management. Simon students attend classes primarily on weekends, while students of NYLS, which offers full- and part-time law degree programs and a two-year JD honors program, attend primarily during the week with some weekend options. Simon’s New York City Center, which had been located in a commercial office building, moved its New York City administrative offices and academic course offerings to the state-of-the-art NYLS facility. Students are now able to take advantage of the classrooms, library, meeting and event spaces, and other amenities of NYLS’ high-tech urban campus, located at 185 W. Broadway at Leonard Street. The move to lower Manhattan provides students with a comprehensive and unmatched learning environment, along with direct access to Wall Street, the city’s civic center, and tech corridor. This is the only co-located law school and business school under one roof in New York City. “We look forward to welcoming the business school faculty, staff, and students to our campus and building a culture of community between our schools, while maintaining each individual institution’s identity,” said NYLS Dean Crowell. Each institution offers an impressive array of course offerings and opportunities for high-caliber professional study. The schools are working to develop new opportunities for law students to receive business education as part of their legal studies, as well as to offer corresponding legal coursework to business school students. 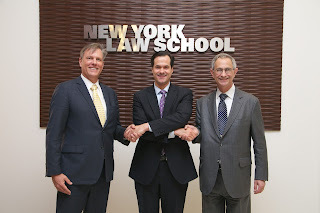 Dean Andrew Ainslie, New York Law School President and Dean Anthony W. Crowell, and University of Rochester President and CEO Joel Seligman celebrate the Simon/NYLS partnership. Recent changes in the technological, legal, and clinical arenas are creating new partnerships and business alliances that are changing health care delivery. On May 29, 2015, national leaders in government, business, health care, and public policy gathered for the inaugural d.Health Summit in New York City. Their aim was to discuss the implications of these changes on delivering health care for aging Americans. It is estimated that by 2030, enrollment in Medicare will double to approximately 80 million people, creating a critical need to reassess methods of health care delivery. Co-organized by Abraham (Avi) Seidmann, Xerox Professor of Computers and Information Systems and Operations Management at Simon, and Dr. Ray Dorsey, David M. Levy Professor of Neurology and co-director of the Center for Human Experimental Therapeutics at the University of Rochester Medical Center, the d.Health Summit explored disruptive health care models, new applications of technological advances, creative economic models, enlightened health care policies, and novel partnerships and alliances. Prof. Seidmann and Dr. Dorsey are researching new treatments for movement disorders to improve the way care is delivered for individuals with Parkinson’s disease and other neurological disorders. Using simple, Web-based video conferencing or telemedicine, they are seeking to provide care to individuals with these diseases anywhere they live. Former All-Pro NFL linebacker and renowned yogi and mindfulness expert Keith Mitchell announced a new collaboration with the URMC that combines holistic medical practices and traditional Western medicine to treat military veterans and former NFL players, which could serve as a new model to care for America’s aging population. For more, visit www.dhealthsummit.org. Alumnus Award. Zemsky delivered the Commencement address. Nearly 700 students received graduate degrees during Commencement ceremonies on June 7, 2015, at the Eastman Theatre, bringing the number of Simon alumni to more than 15,000. University President and CEO Joel Seligman presided and Dean Andrew Ainslie delivered his first Commencement salutation as dean. 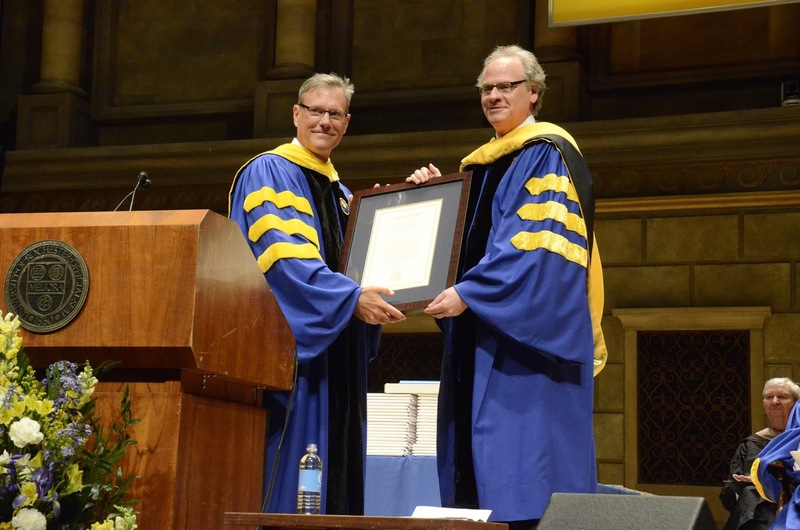 Howard Zemsky ’86S (MBA) gave the Commencement address and received the Distinguished Alumnus Award. Zemsky is president and CEO of the Empire State Development Corporation and commissioner of New York State economic development. A graduate of Simon’s Executive MBA Program, he was appointed by Governor Andrew Cuomo in January 2015 to the post. Zemsky is a Buffalo-area developer who led the redevelopment of the historic Larkin District with his company, Larkin Development Group, and worked closely on the governor’s Buffalo Billion Initiative. He is also chairman of the Niagara Frontier Transportation Authority. In addition to his Simon MBA, he earned a bachelor’s degree from Michigan State University. A longtime Simon benefactor, Zemsky has hosted alumni gatherings in the Buffalo area (including at the Larkin Building he redeveloped), mentored students, and helped attract prospective students. He has also generously supported Simon through his membership in the George Eastman Circle, the University’s leadership giving society. 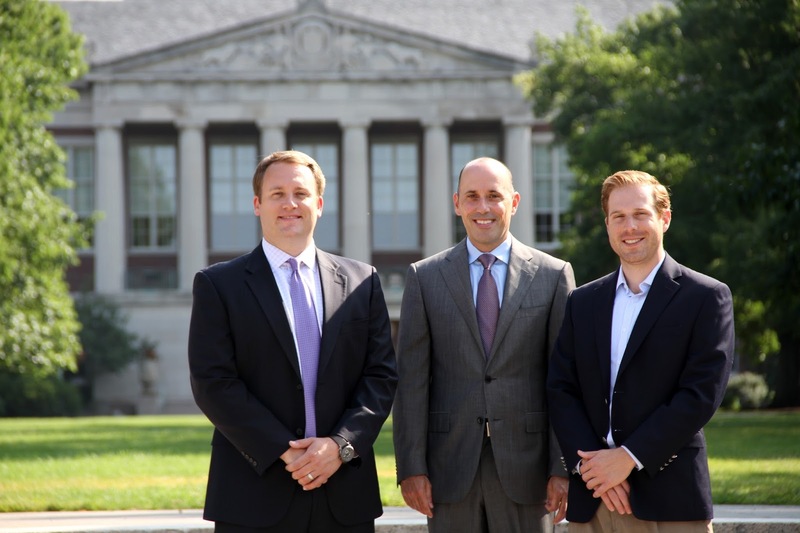 Simon welcomes three distinguished scholars and promotes two current faculty members. Shiming Fu, visiting assistant professor of finance, is visiting Simon from the Fuqua School of Business at Duke University, where he recently completed a PhD in finance. Fu also earned an MS in economics from Arizona State University and a BA in economics from Nankai University in China. His research interests are in financial economics, corporate finance, and dynamic contracting. 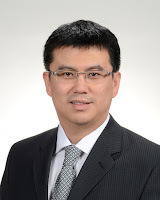 Yufeng Huang, assistant professor of marketing, recently earned a PhD in marketing at Tilburg University (the Netherlands). He also holds a bachelor’s degree in economics from Sun Yat-sen University (China), and a research master’s in economics from Tilburg University. Huang has research interests in demand estimation, learning, quantitative marketing, and structural econometrics. 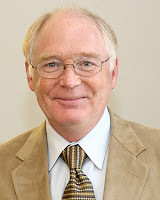 His teaching interests are in marketing research and marketing management. Ricky Roet-Green, assistant professor of operations management, recently completed two postdoctoral fellowships at the University of Toronto in mechanical and industrial engineering at the Centre for Maintenance Optimization and Reliability Engineering (C-MORE), and in operations management at the Rotman School of Management. Her scholarly interests are in operations research, operations management, service systems, queuing theory, game theory, and mechanism design. Previously, she was an instructor at Tel Aviv University, where she won awards for teaching excellence and earned a BA in economics and political science, an MA in political science, an MSc in applied mathematics, and a PhD in operations research. Vincent Hope, adjunct lecturer in marketing, has been promoted to full-time clinical assistant professor of marketing. Hope has a 30-year career in leveraging customer knowledge in the creation of business opportunities. His experience is in business development, market research, and smart marketing applications for data-rich environments. Hope started his career in industrial film and TV commercial production and went on to help build and lead the globally recognized market research firm Hope Reports. With lifelong service to Fortune 500 companies, in recent years he has privately developed corollary capabilities for regional and young startup firms. Hope earned a BS in psychology at Denison University and an MBA in finance at Rochester Institute of Technology. Carol C. Shuherk, adjunct lecturer in business communication, is now full-time clinical assistant professor of business communication. 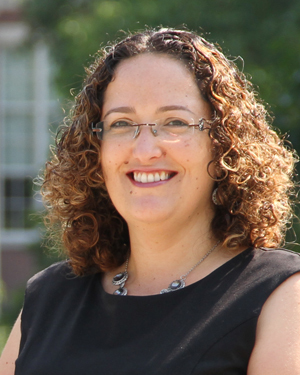 Shuherk previously served as senior associate provost for the University of Rochester, where she led campus-wide faculty development programs and supported initiatives in diversity, sustainability, and community engagement. Previously, she was director of the University of Arizona Program for Academic Leadership and served as interim associate dean for master’s programs at Arizona’s Eller College of Management. Prior to that, she was an associate clinical professor of business communication and academic director of the full-time MBA program at the University of Southern California Marshall School of Business. Her business experience includes a long-term affiliation with The Los Angeles Times as an organization development and leadership-training consultant. She earned a BA in speech communication from the University of Toledo, followed by an MA in rhetoric and communication and a PhD in organizational theory and communication from the University of Oregon. 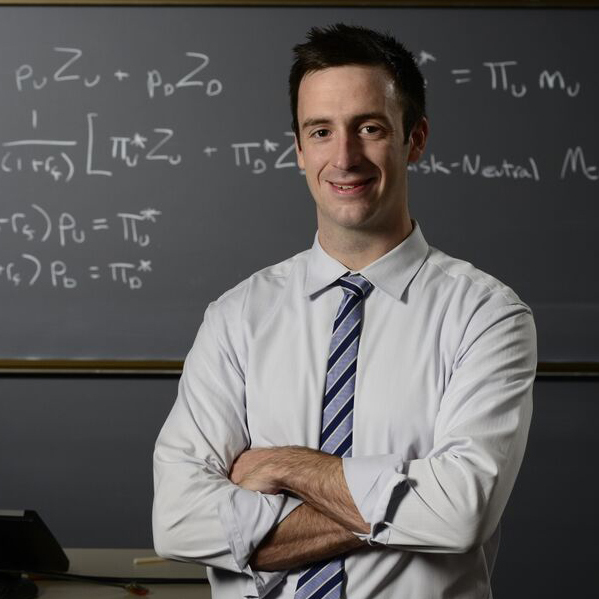 Robert Ready, assistant professor of finance, has received a prestigious award for his groundbreaking research. AQR Capital Management LLC recently announced the winners of its fourth annual AQR Insight Award. 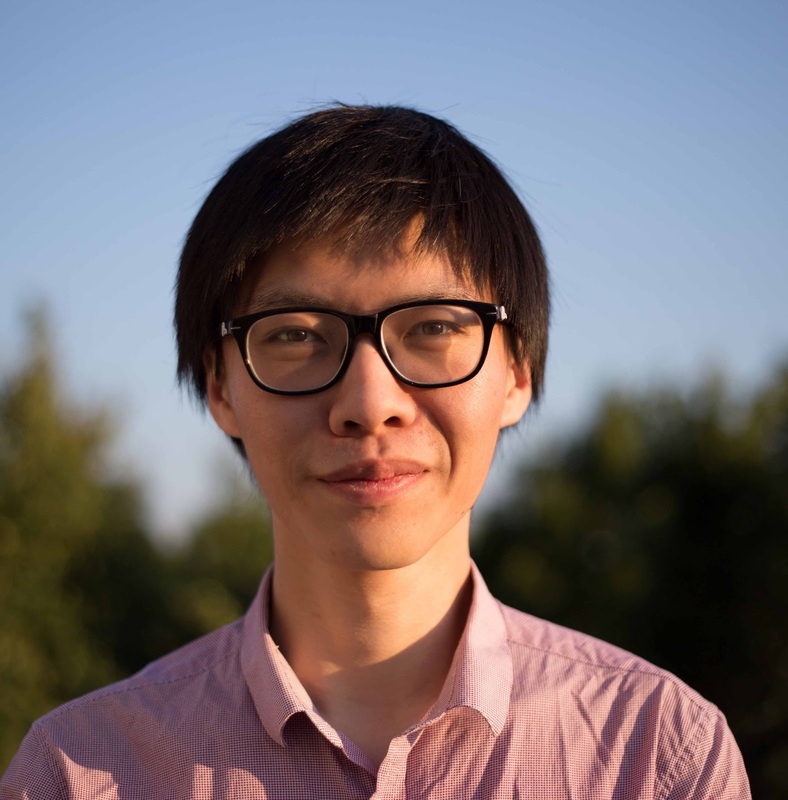 Ready won first prize for his paper “Commodity Trade and the Carry Trade: A Tale of Two Countries,” which describes a general equilibrium model of international trade and currency pricing that can be used to understand profitable carry-trade strategies. The AQR Insight Award honors exceptional unpublished papers that provide original, intelligent approaches to important issues in the investment world, and that stand up to rigorous review. Ready’s research interests are in asset pricing, macrofinance, and international finance; his recent research focuses primarily on commodity prices. His current projects include studying how changes in production conditions lead to changes in the riskiness of commodity derivatives, and examining the relation between commodity price risk and currency risk. He is examining in detail the relations between oil prices and stock market returns as well. Ready earned a BA in economics from Carnegie-Mellon University and a PhD in finance from the University of Pennsylvania. In response to student input and market needs, Simon Business School is restructuring its Part-Time MBA offerings into one centralized program. Starting in September 2015, the renamed Professional MBA (PMBA) program will open need-based and merit scholarship opportunities, as well as team-building and networking skills, to all part-time students. The program, composed of 64 credit hours with nine core courses and 11 electives, may be completed in two and a half to seven years. Students will continue to learn from the same world-class faculty and choose from the same concentrations as the Full-Time MBA program. The restructured program will also provide more focus on networking with broader interactions among student groups. Mary Ann Mavrinac, dean of River Campus libraries; and Evans Lam. 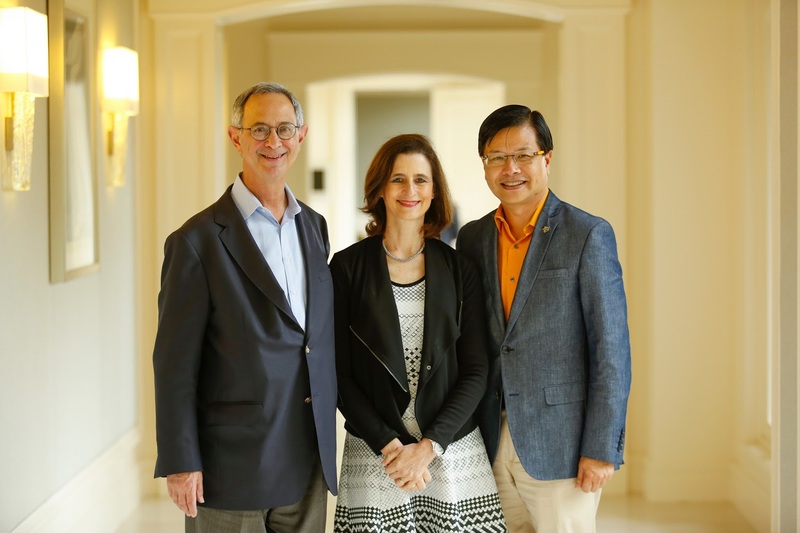 Evans Lam ’83, ’84S (MBA) and his wife, Susanna, have committed $1 million to the River Campus to establish the Evans and Susanna Lam Library Revitalization Fund. The fund will support the modernization of the patron services area in Rush Rhees Library, which will be named Evans Lam Square. Evans Lam Square, a state-of-the-art meeting space located off the Roger B. Friedlander Lobby of Rush Rhees Library, will serve as the central location for library users to do research, collaborate on projects, explore new technology, and unwind. As an undergraduate, Lam worked at the Rush Rhees circulation desk. In 2012, the Lams endowed the Susanna and Evans Y. Lam Professorship, held by Simon faculty member Joanna S. Wu. They have also generously supported several other University-wide faculty and student initiatives. The Lams are charter members of the George Eastman Circle, the University’s leadership giving society. Evans Lam is senior vice president of wealth management and senior portfolio manager at UBS Financial Services, Inc. in Pasadena, Calif. Prior to joining UBS in 2008, he was senior vice president at Citigroup Smith Barney for 17 years. Susanna Lam is a retired CPA, as well as an accomplished opera singer and performer. 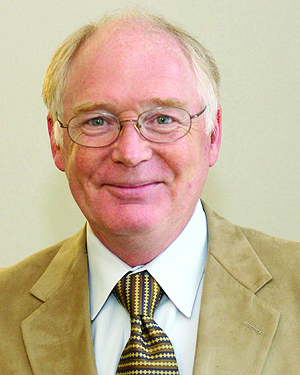 Evans remains closely connected to the University as an advisor, leader, and philanthropist, serving as a University trustee and member of the Simon National Council and the Simon Executive Advisory Committee. He is also a member of the University’s Los Angeles Regional Cabinet. Amy Bruinooge is Simon’s new assistant dean for strategic initiatives. 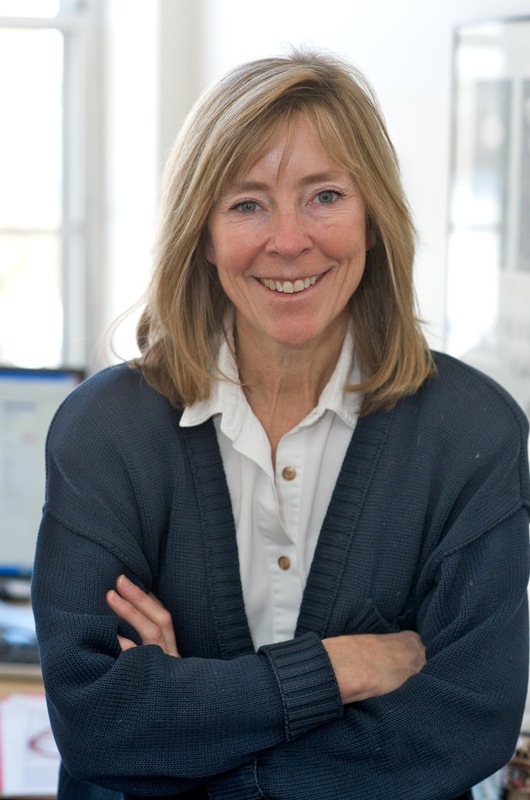 She was previously senior director of academic planning and personnel at UCLA Anderson. Prior to that, she was senior personnel analyst for the Divisions of Humanities and Undergraduate Education in the College of Letters & Science. She holds a BA in English from UCLA and a PhD in innovation and policy change in higher education from the UCLA Graduate School of Education. Simon celebrates its successful alumni with framed portraits. 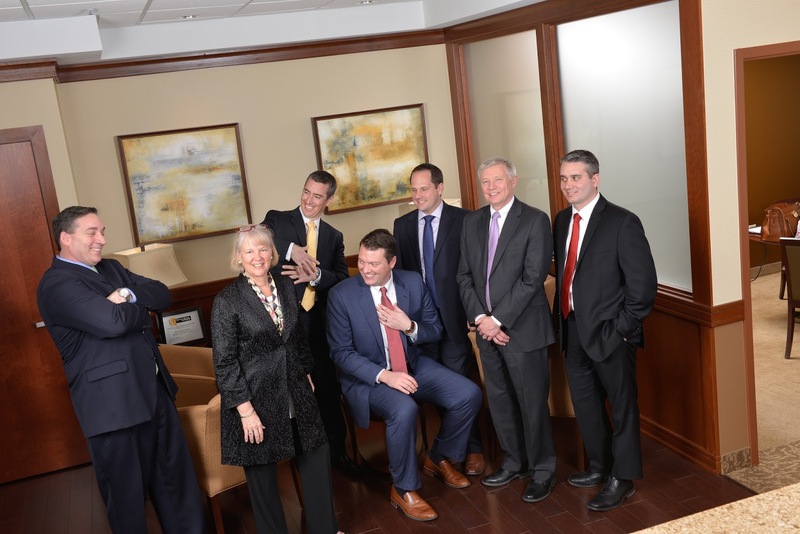 This fun-loving outtake from a recent photo shoot at Broadstone Real Estate shows the close-knit business environment that Simon alumni help create. Broadstone chairman and CEO Amy Tait ’85S (MBA) is surrounded by her staff of Simon graduates. Student startup MotionCorrect was awarded first place and $10,000 in the ninth annual Mark Ain Business Model Competition on May 13. The team included Junning Chai ’15S (MS); Sairam Ramasubramaniam ’15S (MBA); Nishant Saboo ’15S (MBA); and Wenli Wang, a doctoral candidate in biomedical genetics. Kanika Chopra ’15S (MBA), former Graduate Business Council president, and Louis Mistretta ’15S (MBA), are among Poets and Quants’ Class of 2015: The World’s Best & The Brightest MBAs, a survey in which top business schools named their best students. Judging criteria included academic success, leadership in extracurricular activities, and personal excellence. 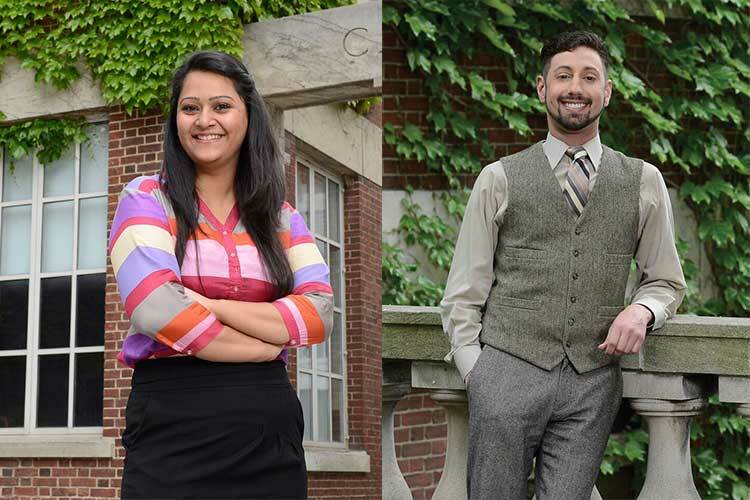 Congratulations to Kanika, Louis, and all the standout Simon students from the Class of 2015. You make us proud! The Simon team won the Entrepreneurs’ Choice award at the Venture Capital regional competition on February 20, 2015, at Yale University. The award is given to the team judged to be the best potential business partner. Jim Newton ’94 is Simon’s new executive director of advancement. He was previously vice dean for administration at SUNY Buffalo Law School. 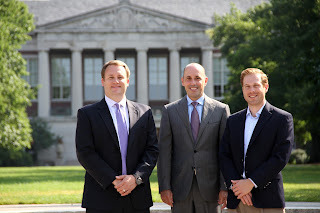 Jeff Piscitelli ’01 joins as director of advancement. He also worked at SUNY Buffalo Law School as a major gift officer and was previously in advancement for the University of Rochester College of Arts, Sciences, and Engineering. Adam Gasiewicz is the new assistant director. His previous experience includes Hispanics in Philanthropy and Media Worldwide.com, among others. Brian Prince ’86, ’89S (MBA) has been named to the University Board of Trustees. Prince is the founder and senior partner of the private-equity firm Hegemon Capital LLC. He recently served as president and CEO of ORIX USA Corporation, a diversified financial services company. Before that, he was chairman and CEO of Aozora Bank, Ltd., a Tokyo-based commercial bank. Work began this summer on the construction of Wegman Hall, home to the just-established Goergen Institute for Data Science (IDS). The new building will serve as an anchor to a planned science and engineering quadrangle. Wegman Hall will be a four-story, state-of-the-art building with lab space, collaborative work areas, classrooms, and offices. Simon Business School is partnering with the Robert Toigo Foundation to offer prestigious Toigo Fellowships for admitted full-time MBA students concentrating in the area of finance. The partnership, which capitalizes on Simon’s respected strength in finance, will provide tuition assistance, networking, and career guidance for admitted full-time MBA students from underrepresented minority groups. 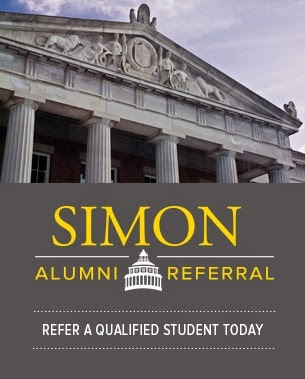 Simon has one of the most diverse student bodies among top business schools. It is one of the earliest members of The Consortium for Graduate Study in Management, an alliance of leading US business schools and members of the national business community whose mission is to encourage and enable African American, Hispanic American, and Native American college graduates to attend full-time MBA programs and pursue successful business careers. The School also belongs to the National Black MBA Association, the National Society of Hispanic MBAs, and Management Leadership for Tomorrow. After a long, cold Rochester winter, Simon students had the chance to get outside and enjoy some perfect spring weather. Offering an opportunity to play in the sun, the event also helped familiarize international students with some of America’s favorite recreational activities, including kickball, tug-of-war, and a delicious barbecue provided by the DaGraca family.